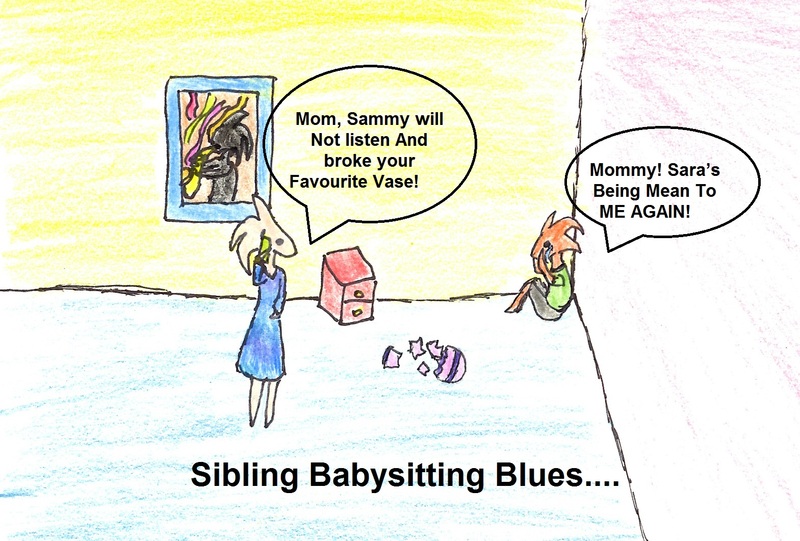 Sibling Babysitters… How Can You Keep The Peace When You Are Not AtHome? The Sibling Babysitting “Star System” works by giving the oldest child an opportunity to receive monetary compensation for being a responsible babysitter and taking respectful care of their siblings while offering incentives to the younger siblings to behave and listen to their older sibling babysitter. Most children are not ready to take on the responsibility of babysitting until they are close to 11 years old. Once they are comfortable staying home alone you can start to prepare them to babysit their siblings? Before I let my children babysit I felt it was important for them to have taken the Babysitting Course offered by the Canadian Red Cross . The program teaches everything they need to know about safety and caring for children from babies to preteen so that they can be prepared for almost any situation that could come up during their time of babysitting. Once your child has taken the Babysitting Course you can start giving them short trial runs with their siblings. When my oldest daughter Marie first started babysitting I would have her look after Anya and James while I was home doing something else or working in the garden. They all had a chance to experience the responsibility of staying on their own without being completely alone. This helped Marie become more comfortable with her roll of being the responsible babysitter and Anya & James to get used to treating their sister as a care giver instead of a sibling. Would have the opportunity to earn between 0 and 3 Stars each time they were babysat. If they were really good and listen to their Sibling babysitter they could earn 3 Stars. If they misbehaved, didn’t listen or started a fight they would receive less Stars. Their older sibling will let you know how they behaved and listened while you were out then tell you how many stars he/she felt they deserved when you got home. Once they reached 15 Stars they would earn $15 towards a new toy or maybe an activity they would like to do. (go bowling or see a movie with mom or dad etc). If they wanted to save the stars up for something bigger that was ok too. Explain to them that while you are out their older brother or sister is in charge and responsible for them not just their sibling. It is important they listen and respect him/her when asked to do something as it is his/her job to keep them safe. Absolutely no Fighting- they need to work hard to keep the peace. If they feel themselves getting angry it is ok to go hang out in their room for a bit till they cool down or they can call you to help fix the issue. If they do choose to get into a fight and can’t work it out themselves they would lose 1-2 Stars depending on how bad the fight was. If I ever had to be called home to deal with the fight they would automatically lose all their stars for that day and have to do a service for me once they had calmed down to make up the difference between the time I should have come home and the time I had to come home. (ie. if I was out for an hour and had to come home after only ½ an hour they would each have to do a ½ hour of laundry folding or some other chore with me to make it up to me) They would also have to do a service for each other (even if it was folding each other’s laundry) to make up for being disrespectful with one another. This one worked really well as an incentive to get along with each other and keep the peace. Explain to them it is important to treat their sibling(s) with respect just like they would someone else’s child while you are out. It is not okay to be bossy or mean with them. He/She is in charge and need to show you they can be responsible enough to handle it. He/She would have the opportunity to earn a “Family” rate of hourly pay for taking respectful care of their younger siblings. I usually set the “Family” rate a few dollars less than the going babysitting rates. After all they were still learning the job and the service they were providing for me was also a way for them to contribute to the household. I was still paying for their food, shelter, clothing etc. For example, their rate of pay could be set from a range of say $0-$5 dollars per hour depending on how they did as a babysitter. When you get home their siblings will report to you how they were treated and if he/she was respectful with them and nice when asking them to do things they would receive full pay. If he/she had been mean, started a fight or picked on their siblings their rate of pay would go down accordingly. If one of his/her siblings had to call you home because their older sibling had started a fight depending on what happened they may get paid nothing. If this ever happened in our home Marie would also have to do a service for me and her siblings to make up for it. Good incentive for keeping the peace and being respectful with her younger siblings. If there were any fights he/she should call you immediately and the two fighting would have to deal with the consequences when you got home and sorted everything out. Make sure he/she knows where the list of all emergency phone numbers including your cell number and a trusted neighbour’s numbers are. The best place to keep this list is on a bulletin board in the kitchen or near the phone for easy access. I would always make sure a close neighbour they knew would be home when I went out so if there was an emergency Marie could call me or run next door for help. It helps to set up a quiet activity before leaving so you know the children will be occupied while you are out. When my kids were little, they didn’t watch a lot of TV during the daytime. On the days I was going out I would save their TV time and let them watch a movie while I was out. Before I left I would set them up well away from each other in separate chairs. I would give them each their own drink and snacks and turn on the show just as I was leaving. Then I knew I would have at least an hour to an hour and a half to shop or run errands while they were enjoying their show. In all the times Marie babysat Anya and James for me I was only called home once to deal with a fight that had gotten out of control. The Sibling Babysitting “Star System” works! It gives everyone incentive to choose to be cooperative and respectful with each other so they all come out Winners! When Is My Child Ready To Stay Home Alone? Welcome back everyone! I have missed blogging but a holiday is always a good thing bringing us back rested and ready to go. Hope you all had a fabulous summer! Have any of you wondered when you could finally leave your child home alone safely? How long you would have to wait before your oldest was ready to babysit his/her siblings or being the way they fight while you are home if they will ever be ready to be left at home alone together? Having young children can make it really challenging to get out and do anything without taking your children with you wherever you go. A task as simple as grocery shopping can be a challenge. I remember trying to grocery shop with my three children when they were younger. My cart was always twice as full because they would add their preferences when I wasn’t looking. There was always an argument over who could push the cart, ride on the cart or help mommy shop and sometimes we didn’t even make it into the store because one or the other was having a meltdown in the car. I couldn’t wait until my oldest child was finally old enough to babysit. What a relief! I could run errands by myself! 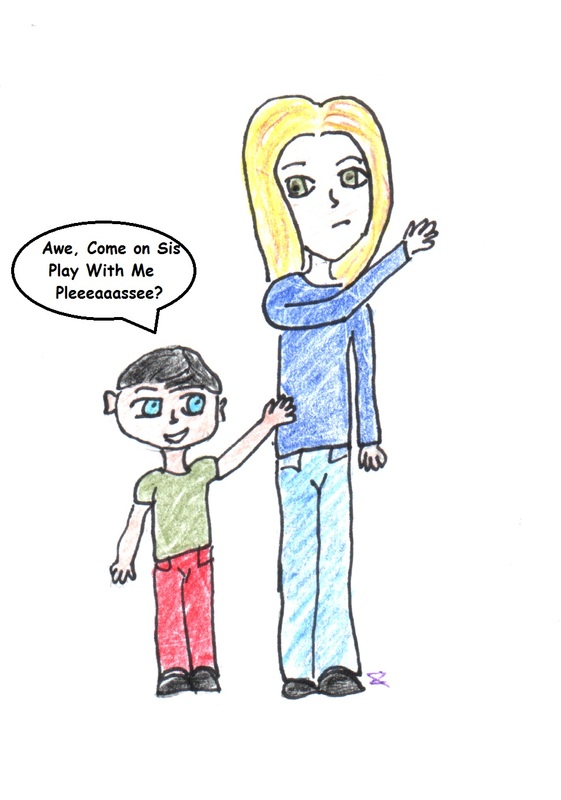 Then came different concerns… What if my other children didn’t listen to her? What if she wasn’t respectful with them? What if there was an emergency? All kinds of things could go wrong while I was out and I wanted to make sure she was prepared. Well over the next couple of weeks I will share some of the tips that worked for me when my children were younger and I finally felt they were ready to take on more responsibility and be on their own. The first step to prepare your child for babysitting is to teach them how to be home alone safely by themselves and feel comfortable staying alone. You can do this on your own by going over all the rules, teaching your child what to say on the phone, how to answer the door or not to answer the door etc. Hopefully your child will listen attentively to you. However, if they are anything like my children their mind will be on something completely different like their next Mindcraft move or art project. Everything I say will go in one ear and out the other. I have noticed over the years that if important information comes from an outside source be it a teacher, coach or mentor my kids will listen. So, when my oldest daughter Marie was 10 years old I enrolled her into the Home Alone Program available through the Canada Safety Council. The program is now also available online allowing you to go through the program with your child at home if you choose. The course taught her everything she needed to know about being home alone safely. What to do in emergencies, basic first aid, how to answer the door, what to say when answering the phone and how to enter and leave the house safely. It covered everything I had been teaching her and more and she listened because it didn’t come from mom or dad. At first I would leave her by herself for short periods of time until she was comfortable being home by herself. It didn’t take her long. Being the oldest she was ready before I was and loved having her independence. It was really nice to go shopping with only two children instead of three and it gave Marie a chance to get used to being home on her own for short periods of time. I always made sure she had my cell number handy and a close by trusted neighbour was home so she could contact someone in an emergency. Once your oldest child is comfortable staying home alone you are ready to start preparing them for babysitting their siblings. Next week I will share the Babysitting “Star System” that worked for me when my eldest started babysitting her brother and sister. The Star System helped to keep the peace amongst my children while I was away and ensure that everyone was respectful with each other and house rules were followed. Have a great week! Teach Your Children The Game Of Gratitude…. The Game Of Gratitude…It Can Change Our Life! Ever wonder why things happen over and over in our lives. Good or bad if we focus on something and think about it all the time we will bring more of it into our lives. When I was younger and had just received my driver’s license I had a minor accident in my car. The memory of the accident created fear in me and I became over cautious. I would constantly be focused on close calls when driving, watching for them, hoping they wouldn’t happen. Well guess what, I got into another minor accident and it wasn’t even my fault. After three accidents I started thinking, maybe my fearful thoughts and focus on people hitting me was the problem. I changed my focus and every time I got into my car I would say, “Thank you for seeing me safely to my destination”. Sometimes if the fearful thoughts persisted I would chant the phrase in my head until I reached my destination. Each time I said the Gratitude phrase I could feel my energy change from one of caution and fear to one of peace and safety knowing I would arrive to my destination safely. I have never been in another accident and the Game of Gratitude was born. I tried using the Game of Gratitude in other areas of my life too like parking spots. Whenever I am driving somewhere I say to myself, “Thank you for the perfect parking spot.” It works every time! The only time I have had to look for parking is when I forget to ask and be grateful for having it. Whether we are expecting something good or bad the universe will make it happen! When my children were little I would play the Game of Gratitude with them. At dinner time we would go around the table and each person would share something good about their day. When my kids complained about something during the day I would ask them to come up with five positive things to say about it. If they were complaining about each other then each child would have to come up with five positive things about the other and share it with them. It taught my children to stop looking for the negative in people and situations and find the positive. Even if it was difficult in the beginning they got better at it and it became easier. If they were being picked on in school, we would discuss different strategies they could use to deal with it. Then say a Gratitude Phrase morning and night, as well as whenever they thought about being hurt, “Thank you for keeping me safe at school!” and “Thank you for my fun, respectful friends.” The problem would usually go away after a couple of days because they no longer felt like a victim and were focused on having good relationships in their life. Very seldom would we have to take the next step of going in and talking to the school about the issue. I taught my children to play the Game of Gratitude in all areas of their life. When they went to bed we would talk about things they were grateful for in their lives and list them off. We would discuss one thing they wanted to change in their day and come up with a Gratitude Phrase they could use to help make a difference for the next day. If there was a moment in their day where they were really struggling with I would have them close their eyes and visualize how they would have wanted the moment to go and to see themselves succeeding. 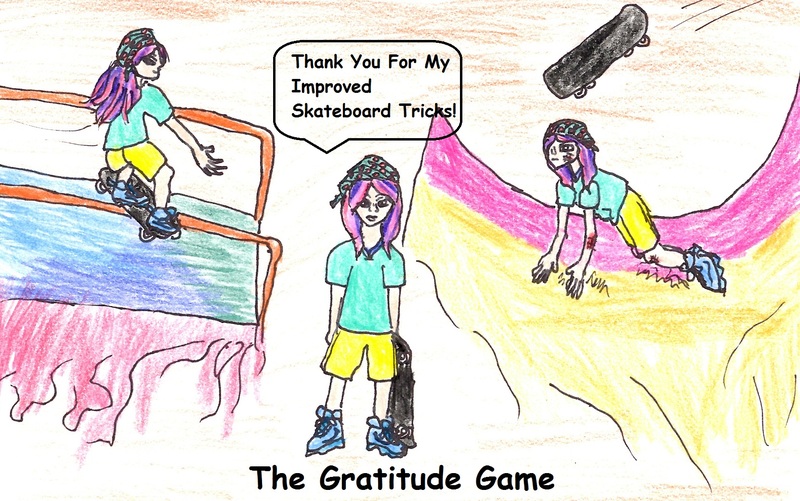 The Game of Gratitude gave a positive focus to the end of their day and helped them settle into their nights rest. We all worry about little things once in a while. The Game of Gratitude helps us put our worries aside and focus only on what we want in our lives. We can change our thoughts and create a happier life for our whole family! Thank you for seeing me safely to school. Thank you for the excellent mark on my Science Test. Thank you for my wonderful respectful friends. Thank you for helping me ride my bike. Thank you for my wonderful parents. Thank you for my nice teacher. Thank you for helping me hit the ball each time I bat. Thank you for a better relationship with my brother. Thank you for seeing mommy/daddy safely home from work. Thank you for seeing child’s name safely home. Thank you for seeing me safely to my destination. Thank you for keeping my family safe. Thank you for my perfect job. Thank you for the harmony in my home. Thank you for the perfect teacher for my child. Thank you for guiding me to whatever you are looking for. Thank you for my perfect health. There are many more Gratitude Phrases out there if you have some you would like to share please feel free to leave a comment. It would be great to have a list for every situation! Looking for a great book on Gratitude? Check out “The Secret“ by Rhonda Byrne or check out the website Moments A Day for some Simple Gratitude games you can play with your kids! 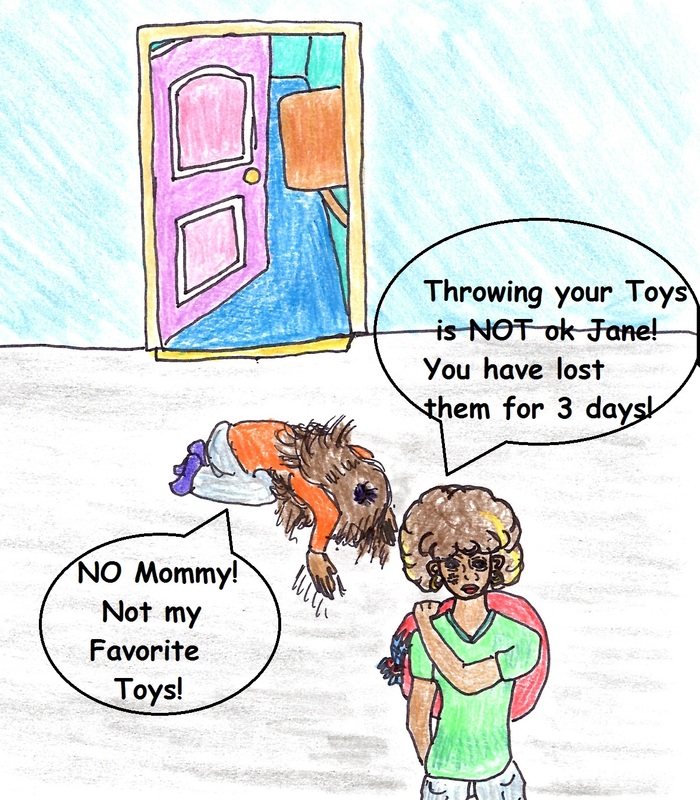 Consequence – With No Toys There Will Be Nothing to Throw! So, now we have established the difference between punishment and discipline let’s talk about discipline and consequences. Discipline is when we correct our child’s behaviour. It sometimes involves yelling (no one is perfect), timeouts or cool down time as I like to call them, taking privileges away or grounding our child from going outside or using electronics. Some methods of discipline work and some don’t. A Consequence in the dictionary is something that logically follows an action. Consequences with children can be a blend of discipline as well as letting the natural consequences of a child’s behaviour affect them providing they are not doing something that would seriously hurt themselves or others physically. For example if a child throws their toys in anger the consequence could be to take all their toys, bag them in a large garbage bag and put them away for a few days. No toys, nothing to throw! Anger is a very difficult emotion to control especially for a child. When my daughter Anya was little she had a very hard time controlling her anger. One time in her temper she broke one of her brother’s toys, hit him, then ripped out all the linen in our linen closet throwing towels and sheets everywhere. She was put in her room for cool down time, given a big pillow and told it was ok to hit pillows but not people. She cried for about 10 minutes and punched the pillow angrily then I went in to talk to her. Sometimes a hug is the best medicine so I sat down beside her and held her until she stopped crying. We talked about what had happened, what she did, what she could do differently next time and what she could do to help make everything better. Her brother was partly at fault too as the instigator of the fight but Anya was the one that over reacted. It was not ok to hit someone or to throw the linen around and break a toy. The consequence of her actions was, she had to pick up and fold all of the towels and sheets she had thrown around (we put a sliding lock on the linen door to prevent future incidents). The toy she broke cost $10 so she had to pay to replace it out of her savings. Anya and her brother had done a disservice to each other in choosing to fight so, they apologized and had to do each other a service of folding the others laundry to make it right. (The service could be anything from helping pick up each other’s toys, or doing a chore for one another.) Then because it had taken half an hour of my time to sort everything out they both had to do me the service of helping to complete the chore I had been working on and fold some of my laundry. Maybe Spanking is Not The Only Way! How many of us were spanked or hit as a child when we did something wrong? For those who were do you still remember how it felt? Do you think it helped you to behave better, scared you into submission or made you want to rebel even more? How many have spanked or hit their child when they did something wrong? How do you think our children feel? As a child I was sometimes spanked when I misbehaved. Mostly by hand but sometimes with a wooden spoon, ruler or threatened with a leather belt and I hated it. Hitting is disrespectful, cruel, and humiliating. I am sure we all know someone in our lives who was severely treated by their parents, caregiver or family member as a child. Why do parents tell children “No Hitting or punching” other children, then think it’s ok to hit the child themselves. What a conflicting message! It’s like saying, “You can’t hit other children or me when you are mad but it’s ok for me to hit you when I am mad.” Not a message that feels good for the child or the parent. 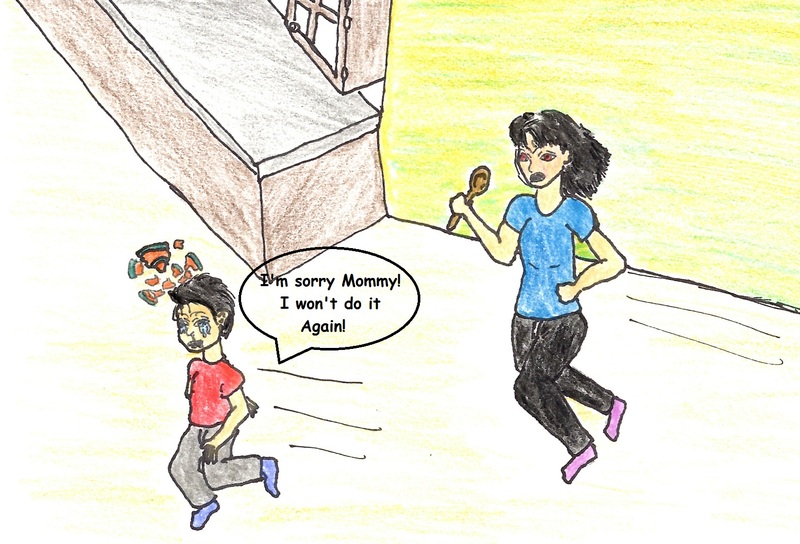 The child is miserable and afraid of the parent and the parent feels guilty and bad about themselves because they hurt their child. As an adult, I could look at it from another perspective. When my parents were little Society thought it was ok to hit children. It was the norm. Kids were given the strap by the principal in schools when they misbehaved, hit on the head with a book or had their knuckles rapped with a ruler by the teachers. My dad’s parents used to punish him for misbehavior by spanking him with a wooden spoon or leather strap. It was all he knew, his parents didn’t know any other means of correcting their child’s behavior so they did the best they could and used the same methods they received as a child from their parents. Lucky for me, when I was about 12 years old my parents took some Life and Parenting courses and our lives changed for the better. They stopped hitting me when I did something bad and used discussion and consequences to teach right from wrong. They would talk to me about what I did, how disappointed they were in my actions and how I had lost their trust. We would discuss how I could earn their trust back and what I could do to correct the mistake. Almost like reverse psychology. For example if I had stayed out past curfew my parents would tell me how disappointed in me they were and how were worried something had happened to me. I would have to earn their trust back by being on time in the future and my consequence would be I couldn’t go out for the next few days so I had some time to reflect on my choices. If my brother and I were fighting we would be separated to our rooms so we could cool down, then we would come out and discuss with mom and dad what was happening for each of us that started the fight and what we could have done differently. The consequence would be whatever we were fighting over be it a toy or TV show would be removed and neither of us would get it. If we happened to break anything during our fight we had to pay to replace it. Consequence discipline was a lot more work for my parents and me. In the beginning I admit I sometimes missed the old quick spank and get it over with method. It was a lot less effort and I didn’t feel so bad about letting my parents down because they had let me down too. Consequences worked though and in the end everyone felt better about ourselves because we worked out our issues with respect for each other instead of pain and hurt feelings. Next week I will share more on “Consequences That Work for You and Your Child”.